Biorhythm is a regular alternation of physical and mental states of a person. Since birth, a number of events and conditions repeat in the life of a person, depending on many influences. Just as the night and day alternates in a regular rhythm depending on the rotation of the Earth on its axis, as the seasons change, it is also possible to describe a number of cyclically recurring states not only in the universe, but also in human life. There is e.g. the breathing rhythm, the heartbeat or the 28 days menstrual cycle. Since the moment of birth until death, biorhythms influence the individual cells in our body and our brain activity. The biorhythms affect more or less the human existence for the whole life. People since ancient times examined the recurring patterns and conditions of life to predict their mental and physical condition, abilities, assumptions and therefore positive or on the contrary, critical days. Scientists, physicians and also teachers engaged in the study and investigation of biorhythms. Using practical observation, long-term research, measuring, comparison, dream analysis, abilities, activities and other procedures they came independently to the conclusion that human life is influenced by 3 basic biorhythms. 23 days physical cycle, 28 days emotional cycle and 33 days intellectual cycle. Each of these cycles oscillates following a sine wave between positive and negative values. Critical days are the days when the wave crosses the zero line. Women are more affected by the emotional biorhythm; men are more affected by the physical biorhythm. Physical cycle (23 days) affects fitness, strength and stamina. Emotional cycle (28 days) affects mood, emotions, perception and creativity. Intellectual cycle (33 days) affects thinking, learning, memory, communication, logical and analytical abilities. Biorhythm chart is mathematically processes overview of biorhythms of so called positive and critical days. In a simplified form, positive value is marked by the + symbol and negative biorhythm value is marked by the – symbol every day, semi critical day is marked by the letter P and critical day by ! (exclamation mark). The biorhythm calendar shows overview of basic biorhythms during 7 days. The negative values of biorhythms are shown red or orange to the left of zero (from the centre of the scale), positive values are shown green to the right of zero. The arrow on the colour scale indicates if the value is trending upward or downward. Biorhythm graph is a sine wave showing the level of biorhythms each day. Personal biorhythm is calculated and displayed on the basis of the entered date of birth. The horizontal axis X shows the time period, the vertical axis Y shows the percentage value from –100% to +100%. In the critical days the wave passes through zero value. The most critical days are those, when the descending wave passes through zero from positive to negative value. The semi critical days are those, when the ascending wave passes through zero. In this Czech comedy from 1974, a timid Frantisek Koudelka (Ludek Sobota) believes that he would be successful in life if he would follow his biorhythm chart. The biorhythm chart compiled in the movie by a computer on the basis of recognized human biorhythm patterns with an overview of positive and critical days was successful and really worked! 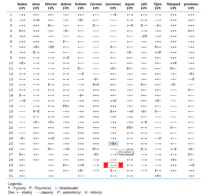 Finally, the movie Jachym, Throw it in the Machine shows that Frantisek’s chart was wrong, because it was made by a mistake for another person. Nevertheless, even then was Frantisek able to find his happiness. Here you can have similar biorhythm chart made like in the movie Jachym, Throw it in the Machine. The biorhythm theory has many supporters, but also opponents. 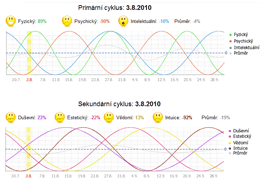 Marie.cz recommends to approach the biorhythm theory and biorhythm charts mainly as a source of positive motivation and entertainment. Realize that even critical days can be a positive experience, because you are ready for them. If you do not prosper, if you have the feeling that all circumstances are against you, remember that willpower and positive thinking can make a difference. And that it is not enough just to dream, but that you have to act as well. Whether you have a lucky or critical day according to your chart, nothing would happen in these days without your effort. Your life and happiness is mainly in your hands. In the negative period of the physical cycle, it is necessary to pay more attention to proper nutrition, rest and healthy lifestyle. Peter was supposed to run a marathon race. 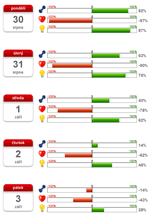 According to the chart, he had a critical day of the physical cycle on the day of the race. He expected therefore that it would be difficult to win. For this reason he put more time into preparation and training before the race than at other times. During the run he tried not to waste energy right after start and at the end he won the race. He did not give up in advance, but he prepared himself better. In the negative period of the emotional cycle do not act rashly, be calmer, more understanding and more tolerant to yourself and others. Jana had first date with Lukas, with whom she already corresponded for some time through the dating website Stesti.cz. They arranged their first date in a restaurant. He was supposed to sit at the table alone and his identification sign was supposed to be a bouquet of roses on the table. On the day of the meeting Jana found out that she has a critical day according to the chart. However, it was too late to cancel the date. When she entered the restaurant, at the table with the rose bouquet sat an entirely different man than she knew from the picture at Stesti.cz. She nearly collapsed. Before the man could notice her she turned and left quickly. She decided to delete her profile at the matchmaking website immediately after arriving home and never contact him again. She was sad and she felt betrayed and cheated. When she sat in her car on the parking lot, she realized that she has her critical day of the emotional cycle. She remembered my advice not to act rashly on such days. She fixed herself and finally entered the restaurant again. When she looked around, she noticed that in the right part of the restaurant sits another man at a table with rose bouquet. That was Lukas. He looked exactly like the picture she knew. Jana and Lukas live together already for several years and they have a little girl. And at the time it could have gone entirely differently. Jana has the biorhythm chart in her family album to this day. In the negative period of the intellectual cycle it is better to think twice about many things, train and exercise memory and logic more, communicate more responsibly and approach mental activities with greater care. Michael’s critical day of his intellectual cycle fell just to the day when he had to pass remedial test in the driving school. He was never very good at learning, therefore he was afraid that he would not be able to pass the test the second time. He knew however that he would have to exert much more effort if he wanted to succeed. Therefore, he studied the test questions where he made a mistake earlier again the day before the test. He passed the test without any mistake. As he said himself, the critical day in his chart made him study much harder.